Curious about how KFC’s chicken is prepared? The KFC Open Kitchen programme is your chance to be a #KFCInsider, get access behind the counter and learn the secrets that goes into the preparation of each piece of our finger lickin’ good chicken. 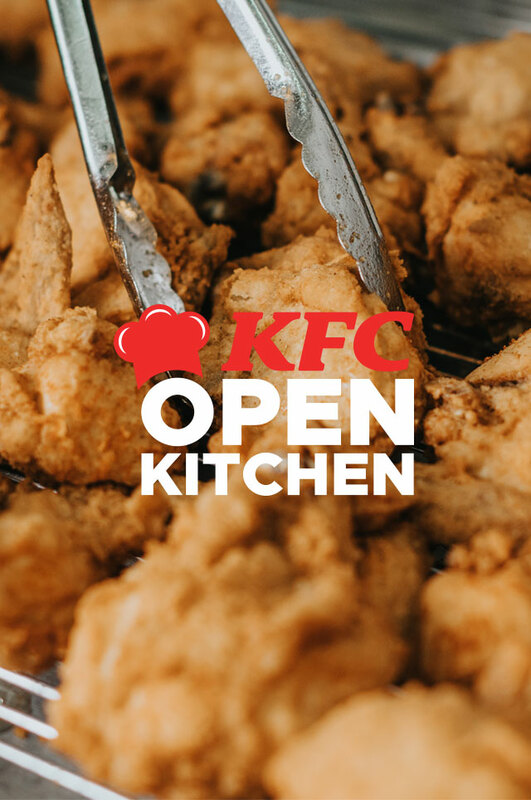 The KFC Open Kitchen programme gives you exclusive rights to enter our highly guarded kitchen, where our famous Original Recipe chicken is freshly prepared in-store daily! In a group of 5 – 8 people, you will be guided into the kitchen by our KFC restaurant managers to discover Colonel Sander’s unique breading technique, and how his legacy is carried out in every KFC restaurant around the world by well-trained and dedicated cooks. As a #KFCInsider, you will understand the importance of chillers for proper storage of fresh chickens in every KFC kitchen. Your journey wouldn’t be complete without a peek into the supply station, where Zinger Burgers and Cheese Fries are prepared! At the end of the programme, you will be served with two pieces of Original Recipe Chicken, two sides and a drink. KFC Open Kitchen will be available in 9 KFC restaurants on every second and third weekend of the month. Each #KFCInsider pass will be priced at $15, which includes a KFC goodie bag and a KFC 2pcs meal. Didn’t manage to get a slot this month? Come back to this website on the 1st of the following month to view available slots. We are fully booked for Apr! Tour will be conducted in English only. Tour participants have to be between 16 to 70 years old, and do not have any physical, medical or other condition which may make it unsafe for you to participate in the tour. Tour participants need to be in non-slip closed-toe shoes and appropriate attire during the tour for safety, as the kitchen floor can be slippery. Participants who are not in proper footwear will be refused from the Tour. Tour participants will need to put on a disposable hair net for food safety, during the entire duration in the kitchen. Hair nets will be provided. Tour participants are to carry their personal belongings with them throughout the tour. Please bring along a small bag (if you need), as the kitchen space might be tight in some areas. Tour participants have to accept instructions and directions which may be given by the KFC Restaurant Staff, including in relation to complying with the Rules of Conduct that will be shared before the Tour. During the Tour, Tour participants are responsible for their own safety and enter KFC’s facilities at their own risks. By attending the Tour, participants waive all legal rights, actions and claims against KFC that arise out of any injury, loss or damage that they may sustain as a result of their participation in the Tour. Food may be provided before, during or after the Tour and participants acknowledge that it is their responsibility to check ingredients to ensure that the food is safe for them to eat in relation to any health condition or food allergy that they may have. Tour ticket purchased is non-refundable and non-transferrable. No refunds will be given to participants in case of a no show. Please feel free to drop us an email at KFCOpenKitchen@kfc.com.sg if you have any questions.